Science is a systematic and logical approach to discovering how things in the universe work. It is also the body of knowledge accumulated through the discoveries about all the things in the universe. 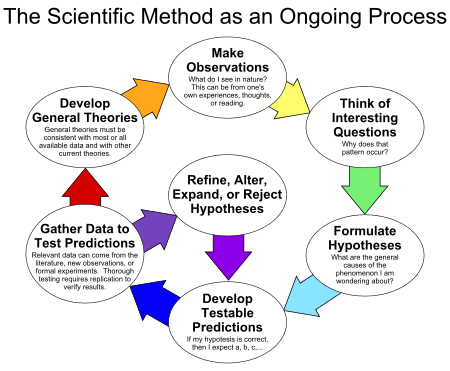 The scientific method is the process by which scientists, collectively and over time, endeavor to construct an accurate (that is, reliable, consistent and non-arbitrary) representation of the world. Recognizing that personal and cultural beliefs influence both our perceptions and our interpretations of natural phenomena, we aim through the use of standard procedures and criteria to minimize those influences when developing a theory. Purpose/Question- What do you want to learn? An example would be, "What doorknob in school has the most germs ?" or "Do girls have faster reflexes than boys?" or "Does the color of a light bulb affect the growth of grass seeds?" Research- Find out as much as you can. Look for information in books, on the internet, and by talking with teachers to get the most information you can before you start experimenting. Hypothesis- After doing your research, try to predict the answer to the problem. Another term for hypothesis is 'cause and effect.' Be sure your hypothesis is testable and includes the independent and dependent variable. Also back up your hypothesis with scientific explanation. This is usually stated like " If I...(do something) then...(this will occur)" An example would be, "If I grow grass seeds under yellow light bulbs, then they will grow faster than plants growing under red light bulbs". Variables: The things that are changing in an experiment. A variable is any factor, trait, or condition that can exist in differing amounts or types. An experiment usually has three kinds of variables: independent, dependent, and controlled. Experiment- The fun part! Design a test or procedure to find out if your hypothesis is correct. In our example, you would set up grass seeds under a green light bulb and seeds under a red light and observe each for a couple of weeks. You would also set up grass seeds under regular white light so that you can compare it with the others. If you are doing this for a science fair, you will probably have to write down exactly what you did for your experiment step by step. Analysis- Record what happened during the experiment. Also known as 'data'. Conclusion- Review the data and check to see if your hypothesis was correct. If the grass under the green light bulb grew faster, then you proved your hypothesis, if not, your hypothesis was wrong. It is not "bad" if your hypothesis was wrong, because you still discovered something! This is the part of your experiment that you will test (vary) to answer your hypothesis. In the example above, the independent variable would be the different colors of the light bulbs. This is what occurs in response to the changing independent variable. In our example the Dependent Variable is how much the grass seeds grow. Controlled variables are quantities that a scientist wants to remain constant, and she must observe them as carefully as the dependent variables. The control should be the part of the experiment where you do not include the Independent Variable. In our example, grass seed that is growing under the white (uncolored) bulb would be your control. The control lets you compare your results in the experiment.